You're not fooling anyone. Flaring your arms doesn't make your puny lats visible. Cure your tiny back disease with hard work and dedication to build a big, thick back. My back is puny! How do I get that thick, V-tapered look? I have come to realize that this country is facing an enormous epidemic. You might not see it on the evening news or find it in a CDC pamphlet, but it&apos;s undoubtedly frightening. The "disease" is known as "ILS" or Invisible Lat Syndrome. Symptoms include, but are not limited to flared elbows, a puffed-out chest, and constantly-retracted shoulder blades. If you find yourself puffing up like a peacock whenever a pretty girl walks by, you might have a case of ILS. Don&apos;t panic. With a little hard work a dedication, we can cure your "illness." This is the prescription you need for more real width in your back. Follow the five-part regimen and you&apos;ll start to develop that coveted V-taper; you can leave those days of flared elbows behind you. I threw a monkey wrench into the machine earlier this year when I explained that I train chest twice per week every week. I was holding back some information though. What I didn&apos;t explain was that I train my back on the same days I train chest. The truth is that if you want more mass, you need to train your back twice per week. I like to alternate chest exercises and back exercises. This allows me to train intensely, keep my heart rate elevated, raise my metabolic activity, and rest one muscle group while the other is working. During the week, I do one heavy day and one lighter day. On heavy days, aim for a total of 12-15 sets of heavy work. Look to push your back to exhaustion by making it work hard. On lighter days, cut the number of sets to 10-15 and increase the number of reps. Chase the pump on lighter days and try to increase the blood flow into your back. 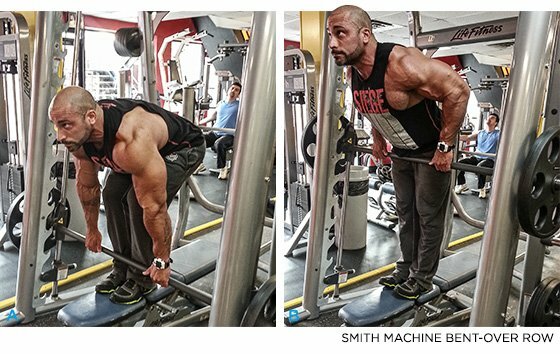 Back training is also about variety, so keep changing your movements and hitting your muscles from new angles. I can&apos;t stress enough the importance of doing wide-grip pull-ups. If you&apos;re still a beginner and can&apos;t do pull-ups, then start on the lat pull-down machine. I usually do about 3 sets to failure, or 25 reps. However, it&apos;s much more important to reach failure than to reach a specific number of reps. As I go through the sets, the number of reps will decrease. This is the one exercise I perform on both days without fail. Heavy day or light day—do pull-ups. I have a secret weapon in my back training arsenal. I learned it a long time ago training in a little dirt-hole gym. I perform bent-over rows using the Smith machine and a bench. To do them, I roll the bench under the Smith machine and stand on it. That way, I can bring the bar all the way down to my toes and get an extra-long stretch without sacrificing form. As I pull the bar up, I lean my body forward so at the top of the movement the bar touches my stomach below my belly button. This allows me to squeeze my back super tight and it also puts tension on all the erector spinae muscles. You can perform this exercise on either day, but I find it better on lighter days with less weight and more strict, tight, and contracted reps. If you really want to develop some lats with thickness, density, and detail don&apos;t skip T-bar rows or dumbbell rows. You can get a little messy doing these lifts. Throw the weight around, huff and puff—basically, tear it up. Remember to keep a tight back though, and don&apos;t turn your core when you lift heavy weight. I like to do 4 sets of 6-8 reps of each exercise. They don&apos;t belong on your light days. Go heavy, go hard, and keep going. On light days, substitute a standing cable row. Set the cable at about chest-level and do single-arm rows. Perform 3 sets of at least 20 reps. Pull fast and hard to work your lats and your entire core. There&apos;s a huge variety of back machine—so many that it can be downright confusing trying to figure out which one is best. I like to look at things simply: If it&apos;s a big, heavy weight, I lift it on my heavy day. I leave the fancy machines for my lighter day. It&apos;s important to enjoy your time in the gym, so if you&apos;re not in the mood to hit a specific movement, I feel it&apos;s better to do something you want to do with intensity and purpose. I&apos;m not saying to just do your favorite dumbbell rows over and over, but go into the gym with an open mind. Don&apos;t just march along the same trail, or you might wear a path into the gym floor. You should lay out your program so you can get a sufficient 72 hours of rest between training sessions. This should be enough time for you to recover enough to reengage the muscle. If you are new to training the same muscle groups twice per week, you might still feel sore on the second day. You can push through. Your body will grow accustomed to the frequent workouts.